Pam is a gifted communicator of God's written word. Her passion is to equip women to study the Word of God for themselves. If asked, she will tell you her ministry is HUGS. She longs for women to experience the love Jesus has for them. 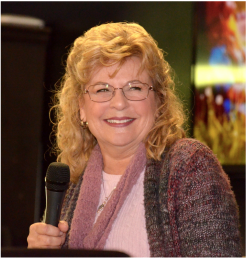 Pam's experience includes writing Bible studies for Saddleback Church and Life Together. For the last decade she has served alongside CJ as the Project Manager and Executive Producer for Infusion Publishing. She is the co-author of Tossed, Tumbled and Still Trusting, Trash the Lies, and Stronger - A Simple Guide for Connecting with God.